It was 6 p.m. when the Devil walked into my office and had a seat. Bounty hunter Victor McCain always wondered how his brother, Mikey, went from down-n-out loser to one of Louisville’s richest men. Now he knew: his brother sold his soul to the Devil. And in twenty-four hours, Mikey would die and spend eternity in Hell unless Victor agreed to hunt down a thief, a woman as deadly as she is beautiful. On a journey of murder and betrayal, Victor must now put his own soul at risk to save his only brother, battle a dark underground organization with the goal of nothing less than global war between Christians and Muslims, and fight creatures from man’s darkest nightmares. Then there’s the Hand of God, God’s own bounty hunter. In the end, will he be friend or enemy? Only Heaven knows. You can buy the book at Amazon and Barns and Noble. For bounty hunter Victor McCain, life is complicated. After losing his soul, he agreed to become the new Hand of God, God’s bounty hunter on Earth. His job? Track down and kill the worst forms of evil Satan can dish out. But when an ancient threat resurfaces, soon the hunters become the hunted. In this action-packed sequel to The Hand of God, Victor is closing in on his brother Mikey, who cost him his soul and stole the woman he loves. Soon he discovers his brother’s “back up” plan: to unleash beings chained in the darkness from the early days of man in order to bring about the annihilation of the human race. With the help of fellow bounty hunter Winston Reynolds, computer geek Kurt Pervis, and the enigmatic Brother Joshua, Victor is ready to spring his trap and rescue the lovely Samantha when it all goes sideways. Now each member of his team is being targeted for elimination. The only question is, can they stay alive long enough to save the world. Tracking and killing demons is all part of the job for the Hand of God, Victor McCain, God’s bounty hunter. 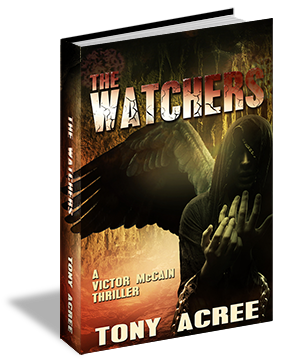 In this fast paced sequel to The Hand of God and The Watchers, Victor learns facing his inner demons may be deadlier than the real ones. Turning to the bottle to drown out the memories of a lost love, he begins to take risks which could get him killed. One night, drunk and alone in a bar in Tennessee, he’s ambushed by members of the Church of the Light Reclaimed. He would have died in the attack, if not for a beautiful stranger named Elizabeth. Later he learns the attack was orchestrated by an old nemesis, Preston Deveraux, and Cyrus Tyler, the new Speaker of the House of Representatives. Victor must lean on the alluring Elizabeth to find the truth behind their plans-only she has secrets of her own which could doom them both. When yet another player shows up on the scene hunting Elizabeth, Victor must find a way to convince the two of them to work together to help him stop Tyler from reaching his ultimate goal: to throw the world into chaos and war. 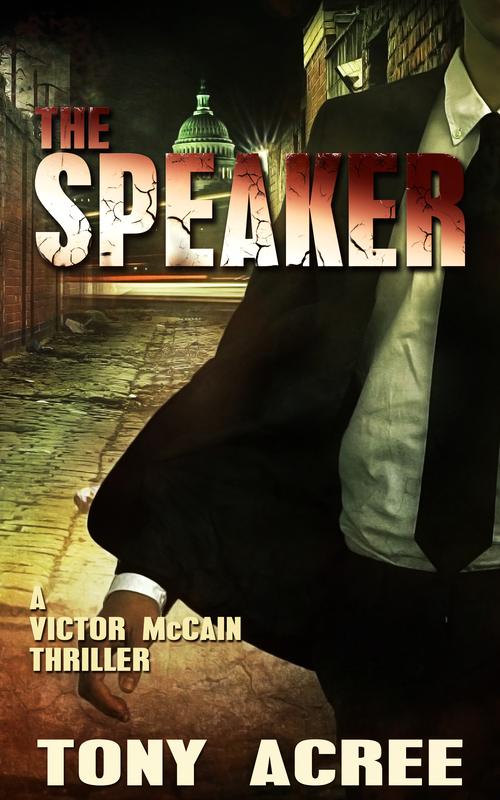 Victor McCain, God’s bounty hunter, knows how to hunt down the world’s most evil beings and remove them. Permanently. In Revenge, the thrilling follow up to The Speaker, Victor learns what it’s like to be the one targeted for death. With a $10,000,000 bounty on his head, assassins are finding their way to Louisville to try and collect on the contract of a lifetime, including Black Ice, the world’s top killer. But he is not alone. An old foe has returned from the dead to seek revenge on Victor by destroying those he holds dear, including a new love. To save her and the others close to him, he must avoid the assassin’s bullet and the efforts of an angry cop intent on putting Victor away for life and unravel a trail of kidnapping, torture and murder. Thanks Julia! It should be out either February or March of 2013. I’ll keep you posted. Just finished reading the book. Overall I found it very interesting. The only thing I saw that was wrong is that bounty hunter’s are not allowed to work or operate in the state. Any chance that there will be another book? That’s the great thing about fiction. The truth is not always needed. You are only the second person to know that fact. I am finishing the sequel this month. Thanks for taking the time to read THOG. Great, I can not wait to read it. SPOILER ALERT THE WATCHERS One question? Will you reveal why you had Vic shoot Sam in the hip rather than the chest protector? You described it as getting hit by a bull when Vic was shot in the chest with his protector on and he nearly was knocked out. It seems that if Vic shot sam in the chest she would have at least been knocked out long enough to subdue her and then Vic ciuld have taken a number of options to release the watchers without putting sams life in as much danger. Usually you have Vic making better decisions i must be missing something. looking forward ti the next book. Excellent question, Tony. The main reason for doing what he did is he was unsure how much of a punch Samantha could take with not just a fallen angel inside her, but the captain of all the Watchers. She is armed, after all, and he needed to make a quick decision. With the thoughts of what happened back in the warehouse with Deveraux and Mikey, it also clouded his thinking. I should have added this type of thought process to the story line. Thanks for asking for clarification. I guess what it boils down to is we don’t always make the smart decision under pressure, even someone like Vic. Thanks for taking the time to read the books and dropping me a line here on the blog.